Veritas: First Djungelsalsa of 2007! _MAL3968.jpg, originally uploaded by Michael A. Lowry. Saturday evening around 17.00 I took the subway down to Gullmarsplan and caught the bus out to Årsta. It was time for the first Djungelsalsa of the summer! 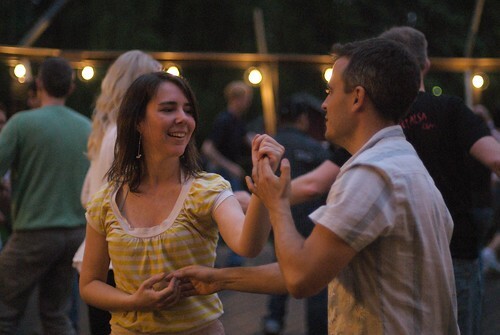 Djungelsalsa (literally, “Jungle Salsa”) is so-called because it's held at an outdoor pavilion, surrounded by forest. It's put together by the same friendly folks who arranged the Happy Feet get-togethers in Sundbyberg during the winter. They set up a couple of charcoal grills, so you can bring your own food to cook on the grill. I brought a few Nürnberger bratwurst and a Bordeaux baguette, along with a few beers to wash down the food. The dancing was a lot of fun, and I probably knew about half of the people there. I can hardly wait for the next Djungelsalsa this coming Saturday! Click to see all 72 photos.